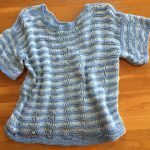 Once you have decided on a knitting pattern, here is some advice on how to follow a knitting pattern, or how to read a knitting pattern for the best results. Before you start to even think about the knitting part, make sure you buy yarn closest to the one recommended in the pattern for the best results. If you cannot get the same name, then you need to make sure that the yarn is the same thickness. The sales staff in knitting shops are usually very knowledgeable about these things, and they should be able to tell you what will work and what yarn to avoid. Very important, always buy two extra balls of yarn, as there is nothing worse than running out of yarn, and then you can’t get exactly the same colour. The next dye lot always seems to be a shade lighter or darker. You can shop for yarn online conveniently by clicking on the yarn picture to your left. Next, make sure you get the proper sized knitting needles. This could be anything from a skinny 000 to a very thick 50. 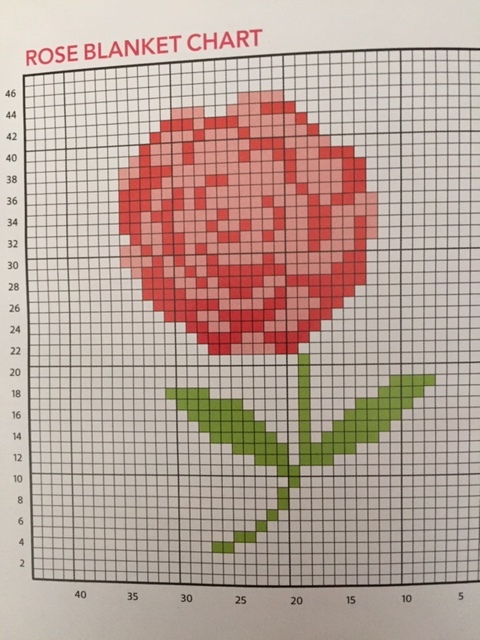 If this is your first project then I recommend you go with something you can make with thicker needles as it will go faster, and thus give you a sense of achievement when you complete your project quickly. The old knitting needle sizes go from thickest 1 to thinnest 12 or 13. If you do have a bunch of old sized knitting needles, you can save money by buying a ruler like knitting needle gauge. This will enable you to measure the needle size and you will be able to see if you have the right size for the pattern you want to follow. You even get gauges in the shape of animals nowadays, like this cute one below. Above, you will see some really good quality bamboo knitting needles which are very popular at the moment, because they are lightweight, durable, mildew proof and easy to knit with. These are excellent knitting needles for beginners to start off with. The entire set above is selling for $8.49 at the time of writing this post. Click on the pic to find out more. The knitting needle gauge on the left is the cheapest one that I managed to find at $ 2.49 at the time of writing this post. It is imperative that you use the correct yarn and correct sized knitting needle that the pattern states, or your garment will either be to big or too small for you. It is a good idea to knit a gauge swatch quickly before you begin to knit your pattern. This will ensure that you have chosen the correct needle size and yarn, and that you are knitting to the correct tension for the pattern you are following. Start by casting on the number of stitches that the pattern designer intends you to have within four inches, and then add six more stitches so that you have a three stitch garter stitch border on each side to frame the area you want to measure. Knit a four inch square in the same pattern that you will be knitting your garment. See if the gauge measurement on the pattern is intended for pre-washed or post-washed fabric. Some yarns will shrink when washed so wash your swatch the same way you will wash your finished item. Next you will have to pin your square swatch down without stretching it to measure it. The area between the garter stitch border should measure 4 x 4 inches. Count the v’s in the stocking stitch across for the stitches and down for the rows. If the size of the swatch doesn’t match what the pattern recommends, then you will need to experiment with a bigger or smaller needle size. If you need more stitches or rows per inch, use smaller needles and if you use less use bigger needles. Keep testing until your work matches up. This is a bit time consuming, but if your are using the correct needles and yarn then your work should match up first time around. You obviously don’t need to do the above if you are knitting a simple scarf or a blanket. 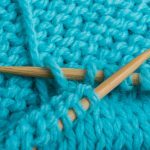 If you are knitting a pattern, it helps to use a ruler on your pattern to help you follow the rows that you are knitting, and not get confused with the one above or below. Tick off with a pencil as you go along, so that you know what you have done. At first, a knitting pattern will look very strange to you, as you will see lots of symbols and abbreviations that will confuse you, but once you get used to it, it is a piece of cake. Click here to see a knitting dictionary of the most popular abbreviations that are used in knitting patterns. Each abbreviation and stitch will be explained. In most cases, the pattern will have a list of the abbreviated terms relating to the pattern included at the beginning or the end of the pattern, which makes how to follow a knitting pattern a lot easier. Here is an example of how to read a knitting pattern. Row 1: K5, P5, then you need to knit five stitches and then purl five stitches on your first row. Knit and purl stitches are the most commonly used knitting stitches, and are used in most patterns. Always start with simpler patterns, and as you get more confident in how to follow a knitting pattern, then you can go more complex. If the knitting pattern has a diagram like this one below, then it means you will have to follow the pattern row by row knitting with the colours indicated on the pattern. So as you can see the picture only starts on row 4 where you will see you have to knit a couple of stitches in green for the end of the stem. As you get deeper into the pattern, then you add more colours as the row dictates. When I use a pattern like this one, I normally photostat it bigger so I can see it better and then I colour in each row as I complete it. Here is an example of a fun and easy book to get your started with your knitting. It will also give you loads of practice on how to follow a knitting pattern. Please comment below if you have any questions on how to read a knitting pattern. If you are looking for an easy knitting pattern, here is a good one to knit a coat hanger cover. Previous Post What Is Paper Cutting and How Do I Get Started? I wish I’d read your article before signing up for a local knitting class! 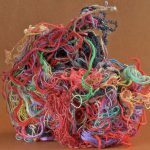 You just de-mystified a lot about how to get started knitting, as well as those crazy abbreviations that intimidate me as a beginner. There’s so much practical advice that I would not have thought of, like buying extra yarn of the same color and knitting a swatch. It’s common sense, but probably not until you learn the hard way 🙂 Personally, as a beginner, I like the bigger knitting needles because they are easier for my clumsy hands to manage. Great advice on this page – thanks! Glad to help you with advice on how to follow a knitting pattern Alyssa. Starting with bigger needles is a great idea. Good luck with your knitting classes. What a wonderful post. I am definitely saving this for later use. Great tip about buying extra yarn. I never thought about the color being slightly off with the next dye lot. I just learned how to crochet and have been trying to learn how to knit. I have been having difficulty transitioning to the 2nd row. I think everything is great, then it all falls apart. I’m left handed so I made a list of some left-handed tutorial guides to watch. Hopefully I’ll get the hang of it. Like I said, I’m saving this page as I know i’ll need some help with the patterns. Thanks so much! Best of luck with your knitting. The second row is the most difficult, but maybe you are casting on too tighly, which makes it worse. Brandy, try learning Continental Knitting. I am right handed but always had trouble. I watched someone doing this and took to it like, as is said, a duck to water. You hold the wool in your left hand. That’s the difference. This is a really helpful guide. I was needing this as I’m willing to start to knit my first sweater. I always saw my grandmother knitting every single cloth all the family wore. Socks, sweaters, gloves, etc. So now that my grandma is not here anymore, I will like to continue with the family tradition. I might be reaching you out with some questions, do you have any personal email? No problem anytime. Just write to the email on this blog. As you know, I’m not a knitter. But my mother in law is, she is actually very good in it. But she doesn’t have any profit from it, which is sad because I’m confident she could make good money with it. What I will do is share this post, even if she is already experienced, because maybe there are some steps that you’ve explained which she doesn’t know yet. And also I can show this to my wife, if she is interested, how to start and what she needs. Thanks for the comment Emmanuel, and hope your mother in law enjoys my blog. Thanks for these great knitting instructions. I love knitting as a hobby but, of course have nowhere the skills you have. To make knitting for profit is a nice Idea but I think for that I’m to old and don’t have the necessary patience. I want to read all your tips here though and try one thing or the other out when I find time. Thanks for stopping by Stefan. I only recommend knitting for profit for those that are really passionate about knitting. For most of us, we treat it as a fun hobby. I never tried most of what you posted about but now have a better understanding of it and why my Mom and daughter like to knit. My daughter will love this post as she is busy knitting for her unborn baby. She has told me a few times that she had run out of wool and couldn’t get the same colour. You don’t leave much for questioning, as you covered just about everything. My mum probably will like this website too. Thanks for stopping by Sam, and I challenge you to try knitting for yourself. Who knows you may find a new hobby you can enjoy and it’s good for the brain. Michel, I love knitting but am a stop and starter. I did a lot of travelling in younger days and knitting is something easy to carry and great to fill the evenings. Your method and explanations are very good and I can’t stress enough the importance of your sampler. I tend to lose tension so I can keep referring to my sampler to see how I am going. I often end up with odd balls of wool. But you can create great things with these. I once had a pile of these so I knitted a jigsaw puzzle sweater using all the different colours. It turned out very nicely and was just so colourful on the child I knitted it for. I did respond to one of your commenters suggesting she tried Continental knitting. Although right handed I always kept dropping the wool. But holding it left handed fixed me right up. Finally, your article has almost convinced me to start knitting again. Good for you. Continental knitting is difficult if you haven’t learnt to knit that way in the beginning, but if you can get it right, wow, it is just so much faster. Michel Maling, Hi! I was so happy to see your article. I will give a gift to my wife, who faithfully and modestly knits for our family: first for the children, for herself and for me. Then grandchildren and friends. And all her products are a joy and gifts. My wife studied your links and she advises. She knits on circular knitting needles and advises to start with scarves. To do this, there are many beautiful thick threads on the firs link. In cases of knitting hats and booties as a gift for newborns, the choice applies to other threads and knitting needles. She intends to purchase a lot of knitting accessories that she has found here. Thanks for stopping by Mark, and I hope your wife enjoys her knitting for many years to come. She sounds as if she gives joy to a lot of people through her hobby.